James Gunn, centre, was presented his trophy on behalf of sponsors, Mackay, West Greenland, by 7-year-old Dhail Mackay, whose father, Andrew, looks on. Young Wick farmer James Gunn was crowned cream of the crop at the annual Caithness Young Farmers’ overwintering competition. 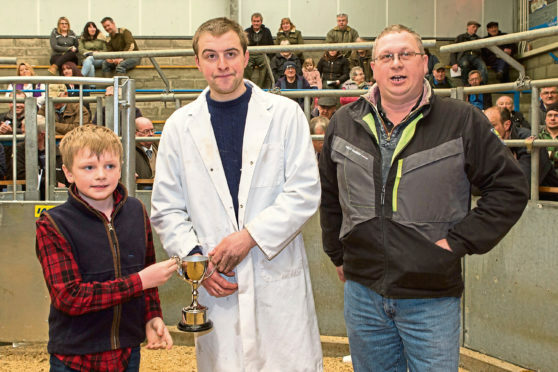 The Bower Young Farmers’ Club member, who hails from Whitefield, Reiss, took the championship title for the fourth year in a row at Aberdeen and Northern Marts’ Caithness Livestock Centre at Quoybrae. His champion in the contest, which was sponsored by Mackay, West Greenland, and judged by Blair Duffton, Huntly, was a 13-month-old Limousin cross bullock weighing 555kg. He was bred by Gordon Begg, of Vauldale, Nybster, and purchased last October for £1,000. He sold yesterday for £1,320 to Backmuir Livestock, Keith. Mr Gunn also achieved the highest price at the sale, and highest profit margin of £390, when he sold his first prize heavy bullock to Backmuir Livestock for £1,330. This was a 15-month-old British Blue cross weighing 687kg, which was bought last year for £940 from C and E Ogg, Buchaam, Strathdon. Other leading prices included £1,275 for a 14-month-old Limousin cross bullock, also consigned by Mr Gunn. Bred by Ardhuncart Farms, Kildrummy, and purchased for £900 from Chris Sutherland at Dunbeath Mains, he sold weighing 623kg to Bill Cameron, Burnside of Edingight, Grange, Keith. The reserve champion from another Bower member – Colin Mackay, of Hillhead, Lybster, Wick – sold to Backmuir for £1,180. This was a 509kg Limousin cross bullock, originally bought for £1,020, from G Sutherland, The Antlers, Occumster. Forss Young Farmers’ Club member Michael Gunn, from Balmore, Dounreay, Thurso, sold two Limousin cross bullocks for £1,240 to Backmuir. Averages: two heifers, 211.6p/kg, £1,075; eight bullocks, 211.6p £1,260.63.